It looks like a hot-air balloon! Bargain price? LOL. How would you sleep? How are you supposed to lie down??? Yeah, but it's not the best way to go incognito. People'll notice a floating onion. OR, ifg you hung it high enough, it'd be perfect for things like that. It'd be safe because no bears or anything, and it'd be hard for a crook to go that high to steal from you... Unless they were a really good crook. Which, knowing my luck, would happen. 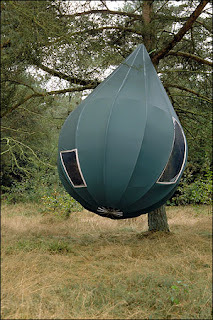 I'd be hiding out and some guy would climb in and begin taking my stuff while I was sleeping. Wow. now we know how Paris Hilton spends her camping trips. In a 50 thousand dollar onion thingy. How quaint. You undoubtedly agree, eh?